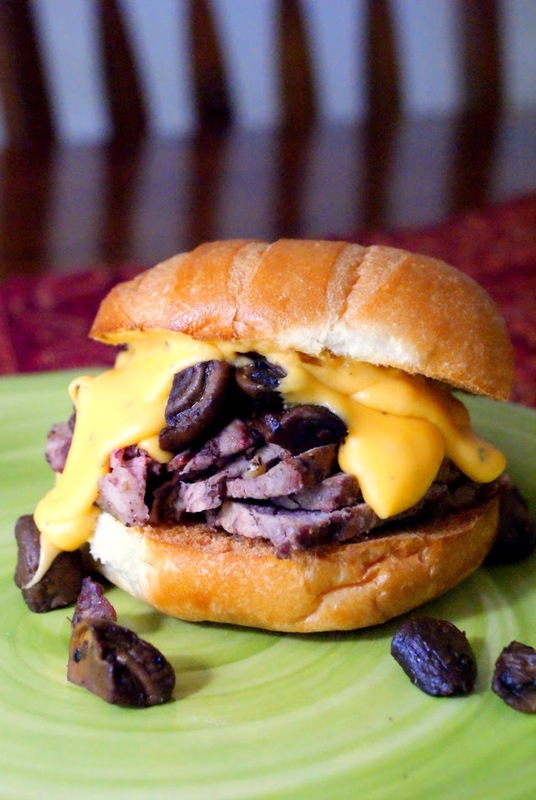 This Filet Mignon Steak Sandwich with Cheddar Cheese Sauce is made with tender, juicy, grilled filet mignon that is topped with flavorful caramelized mushrooms and then smothered with a creamy garlic cheddar cheese sauce. As a participant in the Young and Hungry Blogger Challenge hosted by ABC Family, I was given the task of creating an original recipe in honor of a special father in my life. Father's Day was yesterday, so it was the perfect challenge for me and my fellow food bloggers! I chose to to make a dish inspired by my wonderful husband, the father of my two beautiful kids and my best friend. His FAVORITE dinner is filet mignon with lobster tails and baked potatoes. I decided to put a twist on his favorite protein and turn it into a steak sandwich, which is also one of his faves. Oh, and I totally found it necessary to include my Caramelized Mushrooms on this one. We usually make them with our steak and have to hold back from eating them all before we actually sit down to the table. They were the perfect compliment to this decadent sandwich. As if that wasn't enough deliciousness for one meal, I then smothered the whole shebang in a creamy seasoned cheddar cheese sauce. Totally indulgent and totally screams my husband. I think there would be many a man happy to have this on his plate for dinner! Here's to the Dads! Season the steak with salt and pepper and grill over medium-high heat for 4-5 minutes per side, or until desired doneness. Let rest for 5 minutes. For the cheese sauce, toss the shredded cheese with the cornstarch in a medium sauce pan. Cook over low heat until the cheese just begins to melt. Slowly add the milk, stirring constantly until all of the cheese is melted. Remove from the heat and stir in the worcestershire, salt, pepper, garlic powder. Slice the steak into 1/4 inch slices and place on top of the toasted buns. Top with the mushrooms and the cheese sauce. Add more milk or more cheese to the sauce to get the consistency you desire. I was one of the select bloggers invited to participant in the Young and Hungry Blogger Challenge. I was provded with a kit to help complete the challenges. All thoughts and opinions are my own.